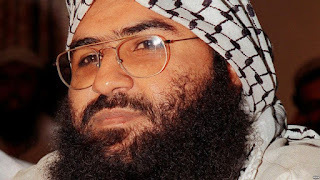 Jaish-e-Mohammad chief Masood Azhar of masterminding behind attack on the Pathankot air base in Punjab, India January-2016. India had requested that masood shoud be added to a UN Security Council blacklist of groups linked to Al-Qaeda or Islamic State, but China objected. China has put a hold on India's request. UN diplomats said on friday, eliciting an angry reaction from the Indian government. Kashmir based group Jaish-e-Mohammad has already been blacklisted by the 15-nation Security Council, but Masood Azhar. It is not immediately clear why China requested that a hold be placed on the Indian request to blacklist Masood Azhar. Technical holds can be lifted and often arise when a Security Council member wants more information. But sometimes they lead to a permanent blocking of a proposed blacklisting. Asked about China's decision to place a technical hold on the proposed blacklisting of Masood Azhar, Chinese UN Ambassador Liu Jieyi offered no details. Liu said listing would have to meet the requirements for blacklisting. Pakistani security officials said that a special investigation team set up in Pakistan to probe the Pathankot attack found no evidence implicating Masood Azhar. If Masood Azhar was blacklisted by the UN Security Council, he would face a global travel ban and asset freeze. January 2 attack at Pathankot was followed by a raid on an Indian consulate in Afghanistan that has also been linked to Jaish-e-Mohammad, or the Army of Mohammad. Jaish-e-Mohammad militants are blamed for a 2001 attack on India's parliament that nearly led to a war between the nuclear armed rivals.